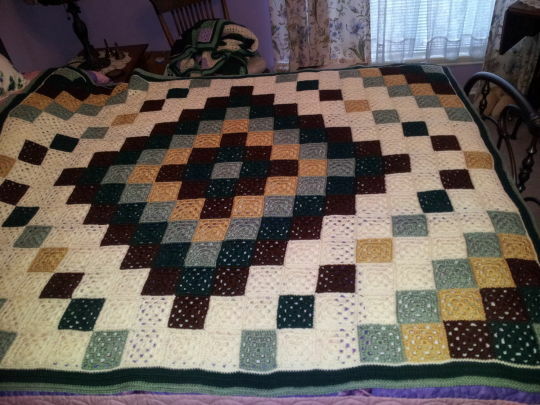 This was a baby afghan pattern I converted into one for adults by making the granny squares three rounds instead of two, using an H needle and using adult colors instead of baby pastels..
What a great afghan. And so simple to make. You have a real eye for color! This is a really beautiful afghan! I made one with black and many bright colors and crocheted it together with sc in black…so it looked like stained glass windows. I think it’s time to start another one like yours! I have a lot of left-over yarn too. The stained glass effect sounds beautiful. I would love to see a picture of that. Thanks for the kind comments. I like to make it with two dark and two light colors that blend well and off white. One was dark and light purple and green (Mardi Gras colors). Yarnhoarder: I’d like to make this. Can you give me an idea of how to figure how many blocks in each color to make? I realize it matters what size afghan I’m making, but do you have a basic pattern showing the placement of each of the colors so I can count how many of each to make? Thank you for sharing your work! I graphed out the pattern and counted the squares for each color——think I have it. Thanks. I tried twice to post the pattern and it seemed to work. But it didn’t. I’m glad you were able to graph it. do you wash your afghans after finished before you gift? No, I just steam press them on the back side and check to be sure all the ends are woven in. I would only wash if the piece is soiled.